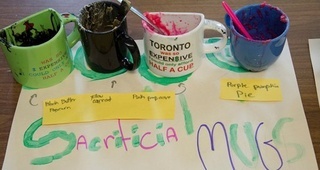 Artists Helen Reed and Hannah Jickling collaborated with grade six and seven students on a food-based piece of public artwork, as part of their ongoing residency at Queen Alexandra Elementary School. QA CHEW'S BUBBLE TROUBLE is an original chewing gum, developed through a series of classroom workshops with elementary school students, teachers, and guest experts, including food scientist Kathrin Wallace. The research compared texture, natural and artificial flavours, and gum ingredients such as sorbitol and xylitol. The artwork is an exploration of gum as an art material, a confectionery, and as a public nuisance that gets stuck on sidewalks and underneath desks. Retail locations for packs of the gum will be announced soon. All proceeds will go towards future art programming at Queen Alexandra Elementary School. QA CHEW'S BUBBLE TROUBLE was selected as part of our artist-initiated public art call. Big Rock Candy Mountain is a public and participatory artwork and residency at Queen Alexandra Elementary school. Reed and Jickling’s first food-based artist edition was the chocolate bar Sour vs Sour. You can follow @bigrockcandy.mountain on Instagram. Big Rock Candy Mountain is supported by Other Sights for Artists’ Projects. Helen Reed and Hannah Jickling have been collaborating since 2006. Their projects take shape as public installations, social situations, and events that circulate as photographs, videos, printed matter, and artists’ multiples. They have exhibited and performed internationally at The Portland Art Museum, The Dunlop Art Gallery, Smack Mellon, The Vancouver Art Gallery, and The Power Plant. Limited gum for sale at the Western Front, 303 East 8th Avenue, from 5pm to 8pm. Gum given to trick-or-treaters at select homes in Mt. Pleasant, Commercial Drive, and Hasting-Sunrise. Flavour historian and writer, Nadia Berenstein, will discuss the past century of flavour cultivation, including how notions of “natural” and “artificial” became measured, manipulated, and manufactured. Berenstein has written for The Guardian and New Food Economy. Retail locations for the gum will be announced in the new year. In 2017 they released Multiple Elementary, a book that explores the elementary school classroom as a site of invention and reception of contemporary art practices, published by YYZBOOKS. Jickling and Reed are recipients of the 2016 Ian Wallace Award for Teaching Excellence (Emily Carr University of Art & Design), a 2017 Mayor’s Arts Award for Emerging Public Art (City of Vancouver), and a 2018 VIVA Award (Jack and Doris Shadbolt Foundation for the Visual Arts).